Gain access to ALL 5 sets of color illustrated ramp plans, including 8ft, 12ft and 16ft wide halfpipe mini ramp plans, a set of 8ft wide quarter pipe ramp plans and a set of free bank ramp plans. 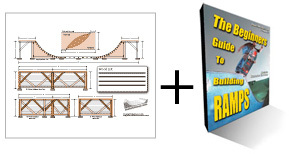 Each set of ramp plans also includes a complete materials list, materials pricing worksheet and the 55 page ramp building guide "The Beginner's Guide to Building Ramps" all in one package! Register your Information for your new account on our site below. You will be able to login and download your files after you register.